Redefy could not be more proud to announce #TheGenerationOfNow. We are devoting a lot of our energy, time, and resources into making this event as successful as possible. The planning will be spearheaded by Ziad Ahmed (Founder and President), Nick Jain (VP of Event Planning), Nicole Hartley (Head Officer of Event Planning), and the entire Event Planning Team. 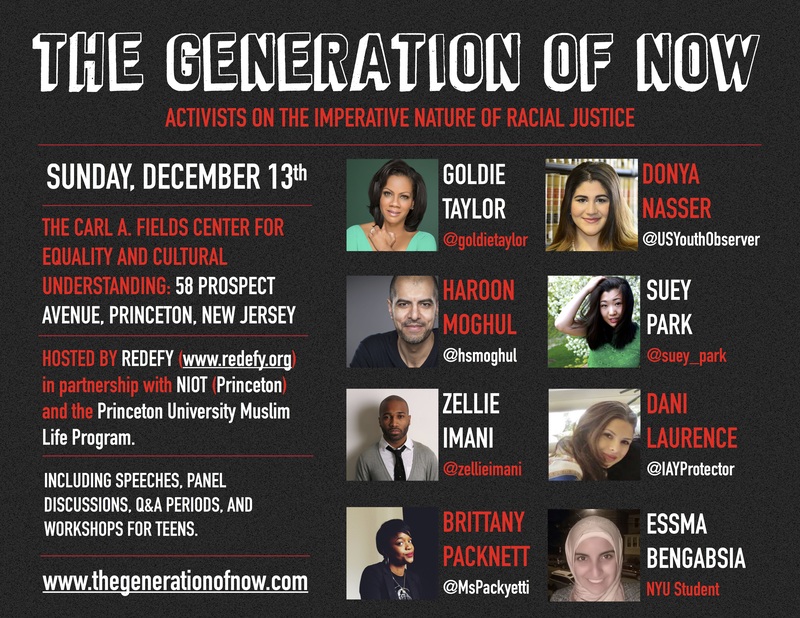 #TheGenerationOfNow will be an event to take place on Sunday, December 13th at the Princeton University Carl A. Fields Center for Equality and Cultural Understanding in partnership with the Princeton University Muslim Life Program and Not in Our Town – Princeton. The hope is that the event inspires many teenagers, and community members to become engaged in social justice work. The event will include a panel discussion, presentations from specific activists, and Q&A periods. Each activist will conduct workshops following the speaking portion of the event to groups of teenagers in order to really focus on how youth can mobilize to make a difference. This event will have a profound effect on the Greater Princeton Area to not only be informed about the current reality, but be inspired to do something about it. This event has the profound ability to really shape the conversation on racial justice in the Greater Princeton Area. So many people are largely uneducated about the current reality of our society, and oblivious to the civil rights movement that is occurring. Our hope is that through bringing really exciting activists that we can inspire people, specifically teenagers, to care about social justice. There is so much nuance in activism, whether it be within the Black Liberation Movement (Black Lives Matter Movement) or the general fight against racism that this generation needs to be aware about. Procrastination has translated into many teenagers activism, faith, and lifestyle, and we hope this event can address that. Our confirmed speakers so far are Donya Nasser (The USA UN Youth Observer), Zellie Imani (Teacher and #BlackLivesMatter Activist), Goldie Taylor (Editor-At-Large at The Daily Beast), Brittany Packnett (Educator and Activist), Suey Park (Daily Dot Contributor), Haroon Moghul (Senior Correspondent at Religious Dispatches), Dani Laurence (Creator the #IAmYourProtector Campaign), and Essma Bengabsia (NYU Student). They will be discussing not only why they’ve gotten involved in racial justice, but why it matters, and why it matters now. We believe that this event will be extremely impactful, and we could not be more excited for it. #TheGenerationOfNow will be held in commemoration of International Human Rights Day, and the event will be open to the public as we hope to embrace in our humanity. Please learn more at: www.thegenerationofnow.com, and like facebook.com/weredefy to stay updated. JOIN our Facebook event here: https://www.facebook.com/events/708533892579547/, and please make sure to invite all your friends! E-MAIL us with any questions, concerns, or ideas whatsoever to contact.redefy@gmail.com. We look forward to seeing many of you at #TheGenerationOfNow! 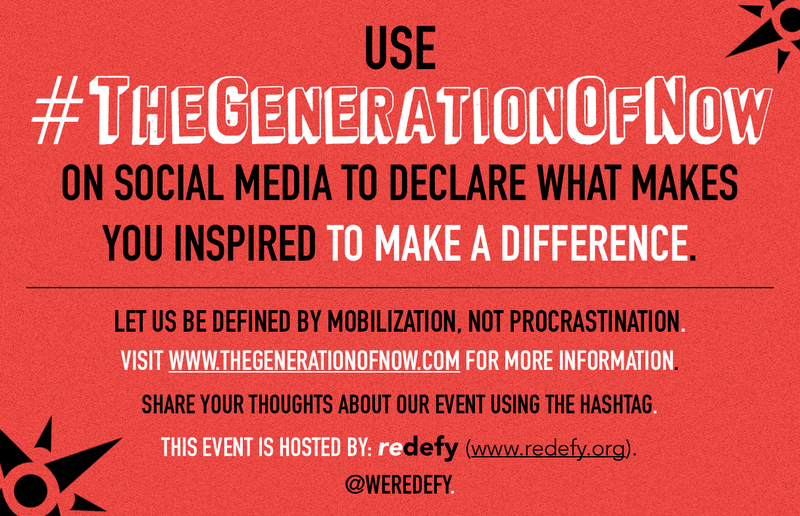 Also, please remember to use the hashtag #TheGenerationOfNow to declare what makes you inspired to make a difference, and your thoughts about this upcoming exciting event.